Experience why Montana is often called the “Big Sky” state as you stake your claim to one of its family-friendly campgrounds. Why it’s so great: Many Glacier Campground sits close to some of the best day hike trailheads in the park: Grinnell Glacier, Swiftcurrent, and Iceberg Lake to name a few. Just be sure to arrive early if you want a site at this popular campground. If you do stay, you’ll be treated with some of the best glacier views, abundant wildflowers and alpine flora, and maybe even a few bighorn sheep, moose, or grizzlies! Facilities: Campground offers 110 campsites and restrooms with flush toilets and drinking water. Tips: Sites are available on a first come, first served basis only. Arrive before 7:00 am and be on the lookout for departing campers for your best chance at getting a site. 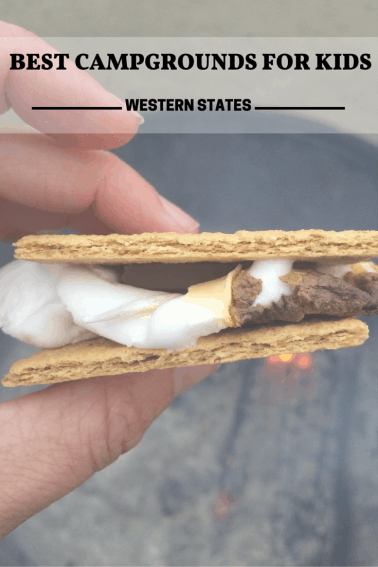 Why it’s so great: Camping, mountain lakes, and outdoor water recreation go together like marshmallows, graham crackers, and chocolate, and Finley Point State Park is where you can find all of these things (just bring the s’more supplies). 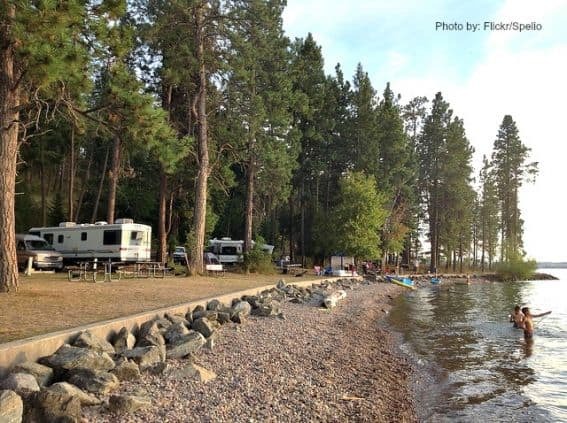 This campground sits at the southern end of Flathead Lake and boasts plenty of water recreation to add to your camping repertoire. Swim, boat, and fish for lake trout during the day, then sleep along the shores at this beach side campground. Facilities: 18 campsites, 16 boat slips that are up to 25 feet long, and boat moorings. Bear resistant storage lockers are available. Tips: RV/trailer size is limited to 35 feet in length, and a joint state/tribal fishing license is needed for fishing at this park. Discover more kid-friendly campgrounds in Glacier National Park and share which one is your family’s favorite. Pack the marshmallows and head to family-friendly Idaho where you’ll discover some amazing kid-friendly campgrounds and unique places to venture about. Why it’s so great: The name of course – what kid wouldn’t want to brag about camping on the craters of the moon? You don’t have to be an astronaut to sleep among these moon craters. Instead, just pitch a tent on this rugged volcanic wonderland. Be sure to register for a caving permit at the monument’s visitor center in order to explore the volcanic caves and tunnels throughout the park. Facilities: 51 sites featuring water, restrooms, charcoal grills, and picnic tables. 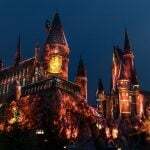 Tips: Sites are available on a first come, first served basis and no reservations are accepted. No wood fires are allowed from October through May. Pack plenty of water as it may be unavailable during certain times of the year. Why it’s so great: Outdoor recreational opportunities abound at this former WWII era naval training station located on the shores of Lake Pend Oreille, Idaho’s largest lake. Swim, boat, hike, and play disc golf, then visit the Farragut Naval Training Center Museum where kids can admire the memorabilia. Be sure to take the little tykes swimming at Beaver Bay Beach, which offers a protected horseshoe-shaped beach that’s ideal for the little ones. Facilities: 217 individual sites, many with water and electricity at the site. All major campgrounds have a shower house with modern restrooms. An RV sanitation dump station is available in the park. Tips: Sites can be reserved online. Be sure to stop in at the visitors center to pick up trail maps and register for the campsite. 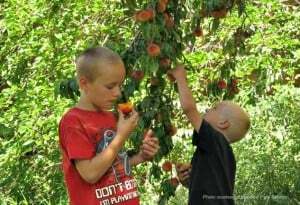 Check out more family-friendly campgrounds in Idaho and come back and share why these places are so great. Incredible wildlife and vast wilderness make Wyoming a grand place to pitch a tent and explore nature with kids. Why it’s so great: This campground’s central location in Yellowstone National Park makes it the ideal base camp for further park exploration. Hike along the Grand Canyon of the Yellowstone viewpoints, then stop in at Canyon Village to stock up on supplies at the store, dine at a Village restaurant, or get cleaned up at the coin operated showers and laundry facilities. Facilities: 270 individual sites including 15 public restrooms with flush toilets, cold running water, and dish washing stations. RV dump and potable water fill stations are also available. Tips: Sites can be reserved online or over the phone. Food storage regulations are strictly enforced – which means don’t leave odor attracting food and personal items unattended or you might get an unwelcome guest such as hungry bears, mischievous squirrels, and an angry park ranger. Why it’s so great: Location, location, location – this campground is close to wildlife, close to Grand Teton National Park, and close to the town of Jackson (just in case you experience a marshmallow emergency during your stay). 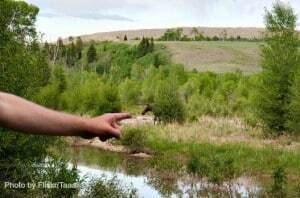 Kids will love spotting the wildlife teaming along the surrounding mountainsides and banks of the Gros Ventre River. Be on the lookout for the resident moose who likes to venture about. Facilities: 300 individual sites and 5 large group sites. Restroom facilities with flush toilets, cold water, but no shower facilities. RV dump and potable water fill stations available. Tips: Sites are available on a first-come, first-served basis. There are two loop areas that do not allow generators and one loop that only allows tents. 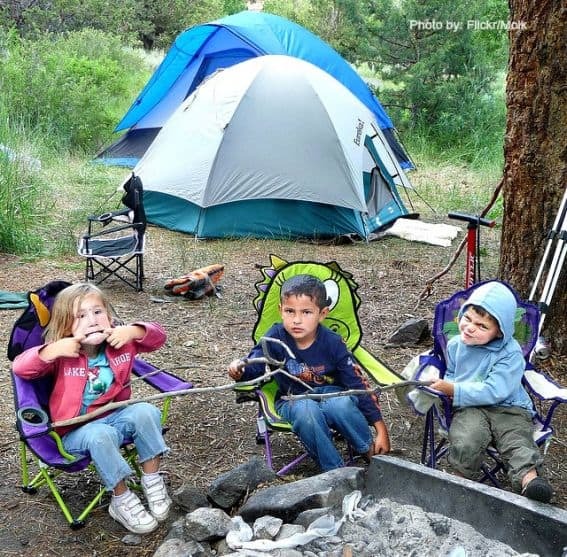 Check out more kid-friendly campgrounds in Wyoming and share your favorite place to reconnect with nature in this state. Remote ruggedness and dark night skies make Nevada campgrounds the ideal place to tell campfire stories, and then snuggle in the tent with the kids. 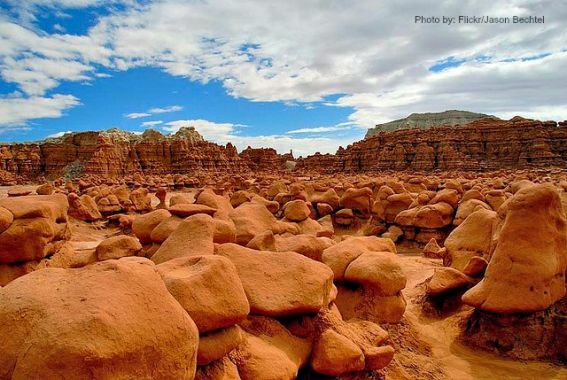 Why it’s so great: Red sandstone, historical sites, and breathtaking viewpoints are just three reasons to camp at Nevada’s Valley of Fire State Park. Throw in some fine grade sand, rock monoliths, and some rambunctious kids, and you’re sure to have a great camping trip here. Be sure to check out this park’s Visitor Center where the collection of extensive interpretive displays will teach kids about the area’s geological and archaeological history. Facilities: Two campgrounds located within the park offering a combined total of 72 sites. Campsites are equipped with shaded tables, grills, water, and flush toilet restrooms. A dump station and showers are also available. Tips: Sites are available on a first-come, first-served basis. Summer temperatures often exceed 100 degrees so Spring and Fall are the preferred seasons to visit. Why it’s so great: Travel below the Earth’s surface where kids will discover stalactite and stalagmite filled caverns during the popular Lehman Caves tour. Discover breathtaking places above the Earth’s surface including the majestic Wheeler Peak with trails dotted with rare Bristlecone Pine trees. This isolated location boasts some of the darkest night skies in the United States making it a star-gazing paradise so be sure to check out some of the astronomy programs offered here throughout the year. Facilities: Five developed campgrounds with vault toilets, picnic tables, tent pads, and campfire grills. There is also an RV dump station located in the park. Tips: Sites are available on a first-come, first-served basis. During the colder months of the year, water is not available. 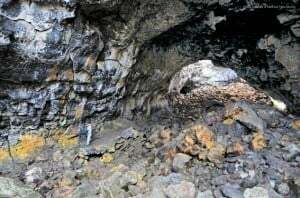 Advance purchase tickets for Lehman Cave tours are strongly recommended by calling (775) 234-7517 or in person at the Lehman Caves Visitor Center upon arrival. Learn more about kid-friendly travel in Nevada. Be sure to come back and share your favorite places to explore. 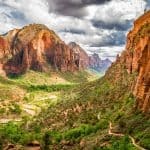 From desert landscapes to high elevation lakes and trails, Utah boasts a plethora of kid-friendly campgrounds for a fabulous family outing. 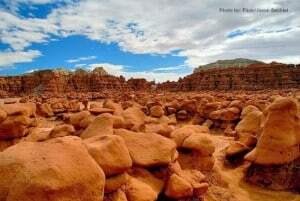 Why it’s so great: It’s a hoodoo paradise! Kids will love scampering around and climbing upon the stone goblins that decorate the surrounding landscape. Spend hours playing make-believe while voyaging through the endless labyrinth of unique rock formations. 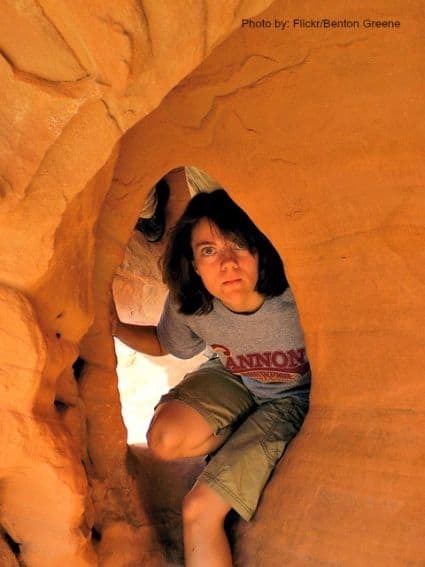 Families with older kids might like to squeeze through a nearby slot canyon, such as Little Wild Horse Canyon located in the San Rafael Swell. Facilities: 24 site campground, group site, and 2 yurts with centrally located restroom and shower facilities. 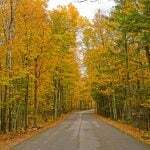 Tips: Spring and fall are the best times to visit this popular campground and sites can be reserved online. The location is remote, so bring plenty of food and don’t forget any precious camping gear. Why it’s so great: Kids will love the natural snacks located right out their tent door. 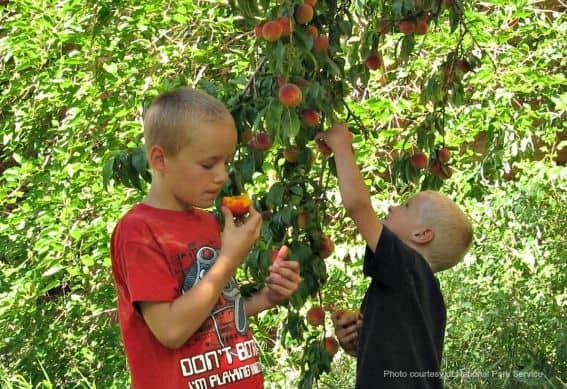 Apples, cherries, apricots, pears, and peaches can be found growing throughout the park’s historic orchards and visitors are invited to consume these fresh snacks while strolling through the historic trees. Be sure to check out the campground’s evening ranger programs, including the ever popular night sky programs featuring powerful telescopes peering deep into space and time. Facilities: 71 sites with centrally located restrooms featuring running water and flush toilets, but no showers. RV dump and potable water fill stations are also available. Tips: Sites are available on a first-come, first-served basis with sites filling up by mid-afternoon. 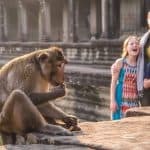 Spring and fall are the most popular times to visit. Learn more about which campgrounds in Utah to book early and be sure and let us know where your family likes to camp with kids. Colorful Colorado offers plenty of tranquil spots for families to camp in the shadows of the towering Rocky Mountains. Why it’s so great: Kids get to play in North America’s tallest sandbox covering nearly 330 square miles. 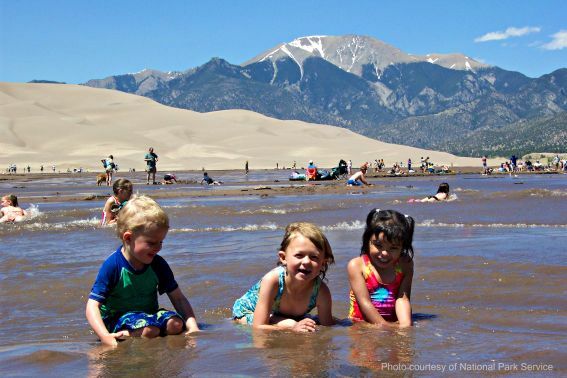 Great Sand Dunes National Park and Preserve invites kids to play in nature’s sandbox, make a few mud pies, then surf the sand waves to a picturesque site at Pinon Flats Campground. Be sure to visit the family-favorite Medano Creek, a popular seasonal shallow stream ideal for little rafters and surfers. Facilities: This year-round campground offers 88 campsites and amenities including flush toilets and potable drinking water. Tips: Loop 1 is available on a first come, first served basis only. Loop 2 (sites 45-88) and three group tent-only sites may be reserved in advance online. Why it’s so great: Sit back and enjoy the views of abundant wildlife meandering through the adjacent meadow with craggy peaks beyond. In addition, Rocky Mountain National Park’s free shuttle bus stops at the campground and provides access to many popular park trail heads. Facilities: In summer this campground has 244 sites; in winter there are 77 sites. During summer, restrooms have flush toilets, except the B and E Loops which have vault toilets year-round. Tips: Summer dates can be reserved online. Winter camping is on a first come, first served basis only. There are no generators allowed in the D loop. This campground offers a solar-heated shower bag stall facility– just bring your own solar shower bag. 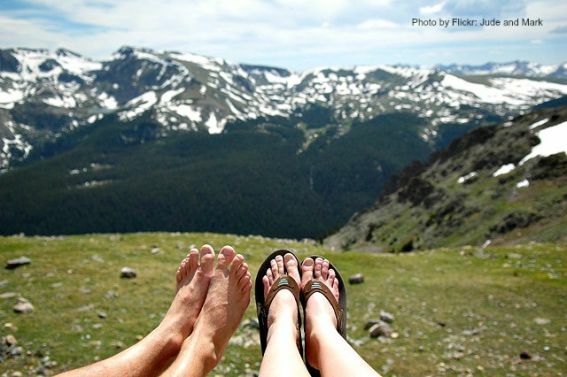 Discover more kid-friendly campgrounds in Rocky Mountain National Park and share which one is your family’s favorite. 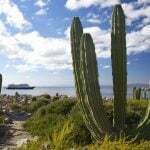 Sunny Arizona offers family-friendly camping experiences in both beautiful red rock deserts and dense mountain forests. Why it’s so great: You can’t beat the beautiful scenery of this Oak Creek Canyon campground. 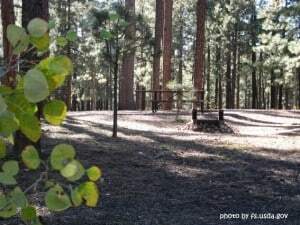 The campsites are shaded by ponderosa pines. Many are even located right along the creek. There are several hiking trails nearby and a stream stocked with trout for fishing. It’s just a short drive away from Slide Rock State Park where families can enjoy one of the best swimming holes in the nation. Facilities: 82 sites, 11 of which are reservable, vault toilets, picnic tables, fire pits, drinking water, and coin-operated showers. 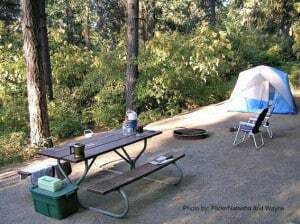 Tips: Since this campground is so popular, it is best to come early on a weekday to get a site. 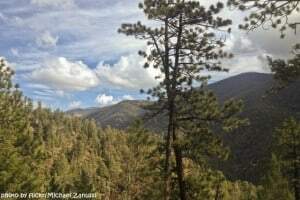 Why it’s so great: Families will enjoy the unique landscape and beautiful scenery of Mongollon Rim. Within this campground there are short hiking trails which lead to the edge of the rim and to a picturesque sinkhole. Located just 5 miles away is Willow Springs Lake, where families can enjoy trout fishing and boating. Facilities: There are 113 campsites (32 with electricity) available for tents, trailers, and motorhomes up to 75 ft. This campground also provides showers and restrooms (flush and vault toilets), picnic tables, campfire rings, and a dump station. Tips: The raining season lasts from late June to August and Canyon Springs often gets afternoon thunderstorms. Come prepared for possible rain and cool weather. 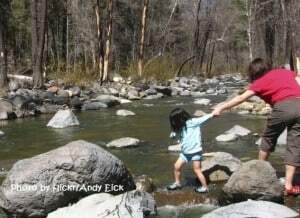 Check out more family-friendly campgrounds in Arizona. Historic waterfalls and charming beaches set against the towering evergreens of Washington State provide unique camping experiences families will love. 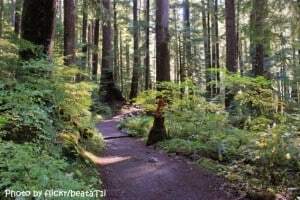 Why it’s so great: This beautiful campground is located in Olympic National Park. 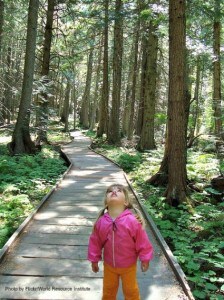 An easy hike will take families to Sol Duc Falls. The hot springs are also nearby and have lots of pools to swim in. In the late fall, visitors can watch salmon leap over the falls at Salmon Cascades as they head upstream to spawn. If you forgot something or don’t feel like cooking, no problem; there is a store and a restaurant in the area. 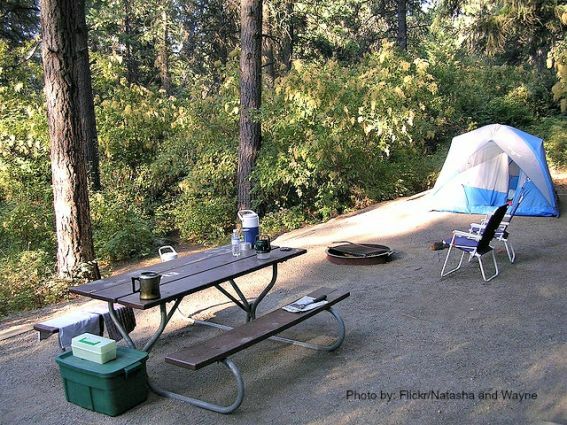 Facilities: 82 sites (including RV sites) with picnic tables and fire pits. Flush toilets and running water available April-October. There is a dump station available for a fee. Tips: All sites are first-come, first-served. Although this campground is open year-round, there is no running water in the off-season, but there are pit toilets available. 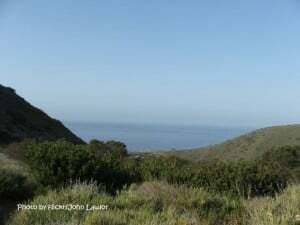 Why it’s so great: Families love the ocean beach, lighthouses, hiking trails, and interpretive center in this scenic 1,882-acre camping park. While camping here you can explore the area’s history or do some beachcombing and ship watching. Nearby coastal towns, Ilwaco and Long Beach, frequently host special events that are great for families. Facilities: 250 campsites, including utility sites, restrooms with hot showers, and one-room cabins and yurts available to rent. There is a dump station in the park as well. Tips: Reservations are recommended, especially during the summer months. And be aware, there is no cell service at the campground, but there is a usable signal at the entrance to the park. Read to head to the Pacific North West? 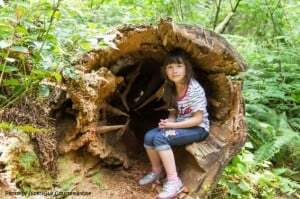 Here are more family friendly campgrounds in Washington State. 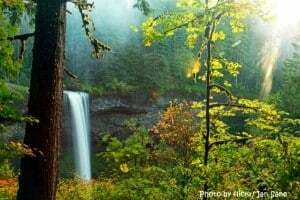 Bring your tent and enjoy Oregon’s scenic beaches and cascading waterfalls as you stay in one of the great family friendly campgrounds. Why it’s so great: The campsites are just a short walk from one of the most scenic beaches in Oregon. Once there families can swim, boat, fish, or beachcomb. 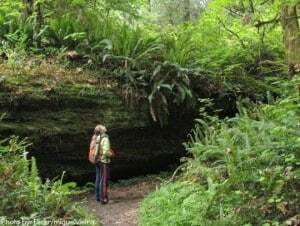 To experience the forest, flowers, and view, explore the network of hiking trails that connect to Shore Acres and Cape Arago State Parks. Be sure to bring the bikes and scooters! Kids will love riding around this flat campground. Facilities: More than 65 tent sites with nearby water, as well as 35 electrical sites and 30 full-hook-up sites. 8 yurts are also available for rent. All campers will enjoy flush toilets and hot showers. 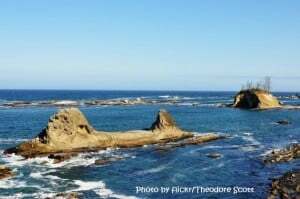 Tips: The hike to cape Arago offers beautiful views, but the cliff is steep, so be careful with young kids. Why it’s so great: One word: Waterfalls. From this campground, families can explore the Trail of Ten Falls which leads through dense forest to breathtaking waterfalls. The entire trail is a 9-mile-loop and has many access points to make shorter routes. The day-use area here features swimming, BBQs, playgrounds, and grassy fields. Families will also love the fun and informative programs offered by the camp hosts. 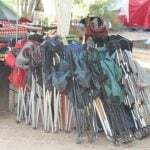 Facilities: Over 100 campsites including electrical, tent, horse, and group sites. 14 cabins are also available to rent. Campground features flush toilets, drinking water, showers, and dump station. Tips: If you are looking for privacy, consider staying in a cabin. The tent sites are a little close together. Also, beware of poison oak on the trails. Oregon’s chock full of family friendly camping. Here are some more options. Explore high plains and deserts in the south to the alpine mountains of the north while staying in a kid-friendly campground in new Mexico: The Land of Enchantment. Why it’s so great: From here, families can experience some of the best mountain views in the Southwest. 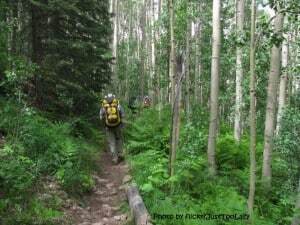 Take an easy 1.5 mile hike loop around the campground and through the surrounding forest of pine, aspen, and fir trees. Several other trails are located nearby. Families can also experience the unique town of Santa Fe, located only 7 miles away. 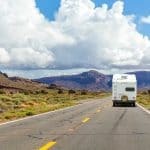 Facilities: 36 sites available for cars and RVs. Campsites have picnic tables and grills. Drinking water and vault toilets are available. There is not an on-site dump station, but there is one nearby for a small fee. Tips: Since this campground often fills up, consider making reservations or arrive early. Why it’s so great: There is a lot of open space for the kids to run in this lovely meadow, as well as access to numerous hiking trails through the aspens. The campsites have the perfect mix of shade and sun. Just downhill from the lower campsites is a stream to splash in and explore. 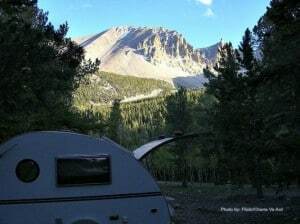 This campground also provides the best view of the surrounding mountain. Facilities: This campground has 39 sites and features water, composting toilets, fire pits, and trash cans. Tips: There are no reservations so get here early for the best spots. Learn more about family friendly adventures in New Mexico. Whether you are adventuring through the redwoods in the north, playing on the sandy beach, or discovering one of California’s national parks, families will love the great camping options they can enjoy. Why it’s so great: Camp in the midst of old-growth redwoods right near the banks of the beautiful Smith River. The sites are large and mostly private. Families can enjoy short, kid-friendly hikes, swim, and fish. Seasonal campfire programs teach families about the abundant and varied wildlife in Jedediah Smith State Park. Facilities: 86 sites for tents or RVs. Hot showers, restrooms, picnic tables, fire pits and barbeques, food lockers and trash receptacles, and a dump station are available. Tips: This campground is always full so make reservations. Campsites 52-58 back up to the river. If you want a great view and the sound of the river lulling you to sleep at night, try to reserve one of these sites. Why it’s so great: Enjoy picturesque sunsets and cool sea breezes. 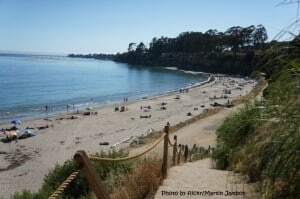 This popular ocean campground is on a bluff overlooking northern Monterey Bay. Activities include hiking, fishing, swimming, bike riding, and more. Kids will love the seasonal Junior Ranger and Campfire programs. Facilities: 72 regular sites for tents and RVs up to 36 feet, 4 premium view sites, and 6 hook-up sites. Amenities include restrooms, showers, and a dump station. Tips: The mornings here are cool and misty and the summer afternoons can get hot. Wear layered clothing to stay comfortable. 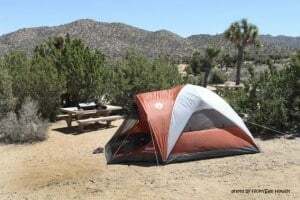 Why it’s so great: Families can experience a variety of desert wildlife here in one of the thickest Joshua tree forests in Joshua Tree National Park. This is the perfect campground for first-time desert campers due to the amenities and seasonal educational programs. Enjoy a wide selection of hiking, birding and stargazing opportunities. Facilities: 38 RV sites and 100 tent sites. Features flush toilets, drinking water, and a dump station. Tips: Spring and fall are the busiest times of year so reserve your campsite early. Also, make sure to bring a camera. The unique shape of the Joshua Trees against the landscape is spectacular during sunrise and sunset. 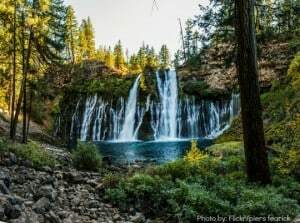 Why it’s so great: The centerpiece of this park is the 129-foot waterfall, Burney Falls, which has been called the most beautiful waterfall in California. Families will love the 5-miles of hiking trails that wind through the park’s evergreen forest. At nearby Lake Britton, spy rare nests of bald eagles as well as enjoy some watersports and swimming. Facilities: 102 sites (17 of which are tent only), restrooms, showers, fire rings, dump station, picnic area, and a convenience store. There are also 24 one and two-bedroom cabins available to rent. Tips: Consider reserving a boat from the marina at the same time you reserve your campsite so you can enjoy the lake without the hassle of bringing your own boat. Why it’s so great: These shady campsites are located on the beautiful Pinecrest Lake. There are great recreation opportunities here including swimming, hiking or biking on the trails surrounding the lake, or fishing. If you keep your eyes open, you may spot marmots, squirrels, coyotes and deer. Be sure to take advantage of the spectacular educational programs. Facilities: The 200 sites include picnic tables, a campfire ring, and a paved parking pad. There is drinking water, flush toilets, and a dump station on-site. No RV hook-ups are available. 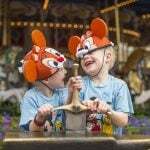 Tips: Reservations can be made up to 240 days in advance. Plan ahead because this campground fills up in the summer months. Why it’s so great: With 1.5 miles of beach, campers can enjoy swimming, fishing, whale watching, surfing, and sunbathing. Families will love exploring the beaches, tide pools, and coastal caves. The main campgrounds are shaded from the California sun by Giant Sycamores. Campers can participate in interpretive programs and nature walks offered at the visitors center. Facilities: 130 sites with fire rings and picnic tables. Campground features showers, restroom, camp store, and dump station. Tips: Reservations fill up fast for the summer months. Book sites up to 6 months in advance. Check out our comprehensive post on the best California campgrounds for families. Did your family’s favorite campground in the western states make our list? If not, let us know about your favorite kid-friendly campground and why it’s so great! Explore the Great Outdoors with your family. Lead image by Shutterstock. Car Camping Gear Guide: our favorite must-pack conveniences. 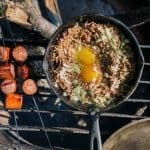 The Best Family Camping Gear! Great place to have the kids going on a camp. This would probably one of my favorite spot. There can be high winds at night off the desert and river, but it ensures clean air and beautiful days. Great post about these kid-friendly camping sites. I’d love to go on a adventures with my kids. I’ll try some of these places on our vacation.